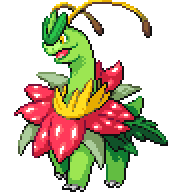 Meganium is a Grass-type Pokémon. It evolves from Bayleef starting at level 32. 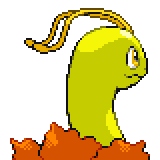 It is the final form of Chikorita. 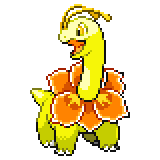 It can Mega Evolve into Mega Meganium using the Meganiumite. 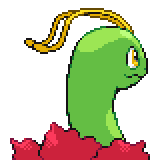 The fragrance of a Meganium's flower soothes and calms emotions. 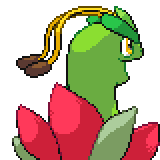 In battle, it gives off more of its becalming scent to blunt the foe's fighting spirit. 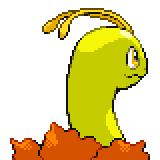 A level of "Start" indicates a move that will be known by a Meganium obtained at level 1. 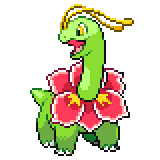 Meganium shares the same base stats with Venusaur (and by extension Delta Venusaur), just in a different order. 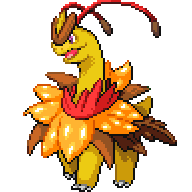 Meganium is the only starter Pokémon introduced in Generation II that becomes dual-typed upon Mega Evolving. 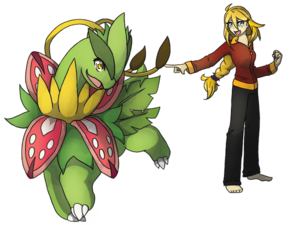 Mega Meganium is tied with Mega Delta Venusaur for the highest base stat total of all non-Legendary Fairy-type Pokémon. 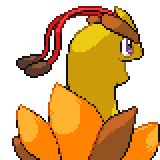 This page was last edited on 18 March 2019, at 23:37.